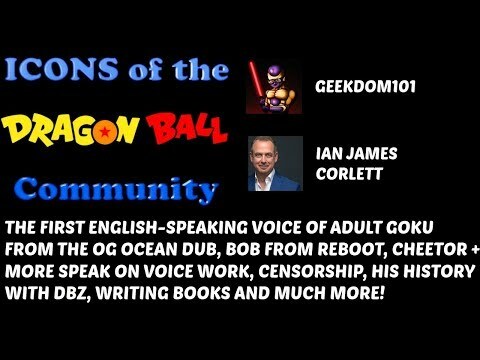 Ian James Corlett INTERVIEW on the newest Icons of the Dragon Ball Community. We discuss the VOICE of Cheetor, the VOICE of Bob from Reboot, Dragon Ball Z Ocean dub and more. Before Sean Schemmel and Peter Kelamis, there was IAN JAMES CORLETT! Ian James Corlett would get along really well Gregg Turkington, as big Bondheads. Well, I guess Ian James Corlett didn't have a very great experience on the voice and Goku, he will always be the Goku I know, she is one of my personal favourite Goku voice actors out of all the rest. Speaking about using the Japanese original to get a sense of timing, I do feel that his "That's not fair!" is pretty close in spoken rhythm to Nozawa's "Nandatou?!" Great voice acting! He was also Bill from Sitting Ducks, another great show! Corlett had the perfect voice for english Goku, but the Ocean scripts were horrible. Man I wish I grew up with dbz I wonder what it was like. I met Ian at TFCon 2016, he was awesome there and he was great in this interview. SEAN SCHEMMEL INTERVIEW PART 1 OF 2: Becoming Goku, Music, Puppets, Life.